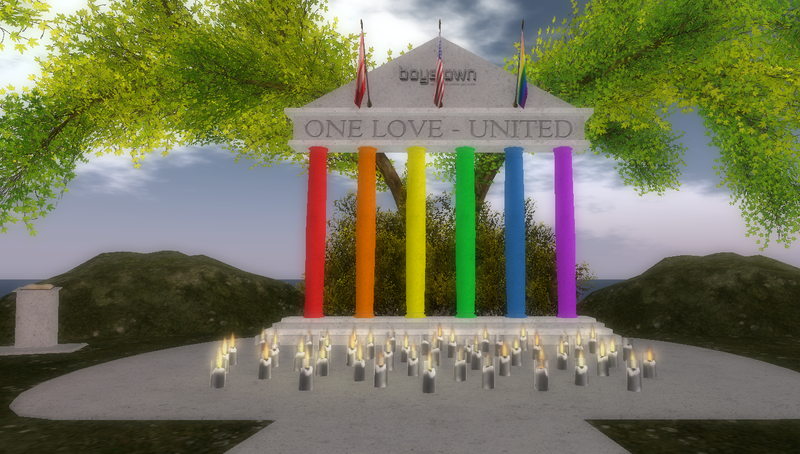 I continue to focus on exhibits; for the daily schedule of events and hunt info check the SL13B Community Celebration blog. Cammino e Vivo Capovolto is on Electrify. Trail of Destiny has some great safari gifts; I did well! By Jordynn Sandalwood. I was momentarily distracted by the expression on this kitty’s face as I walked through the treasure hunt on the ship, just below the welcome area. 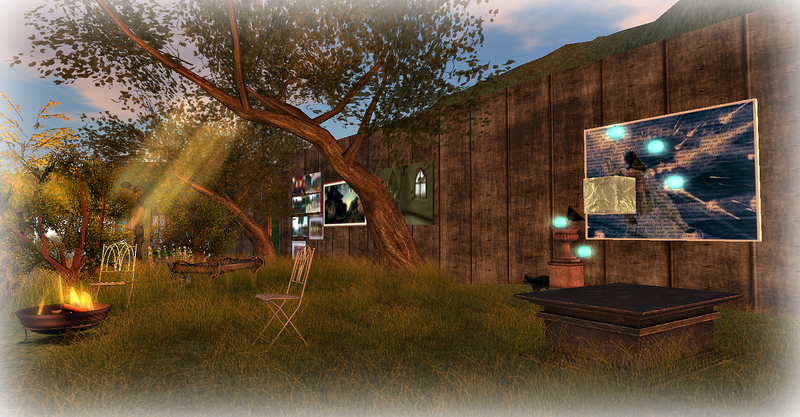 The exhibits in my SL13B posts two through five are ones that caught my eye as I was wandering around. I checked the exhibitors list only for clarification on titles and resident names. Now I’ll check the list more thoroughly for what I won’t want to miss checking out. This exhibit looks great from a distance too. The Centaurs and the Birds. 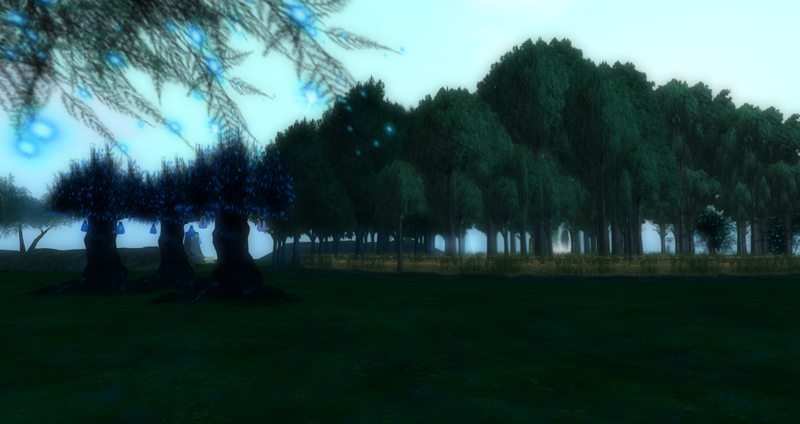 It’s great to see all the green dots and some yellow dots on the map when I visit SL13B. 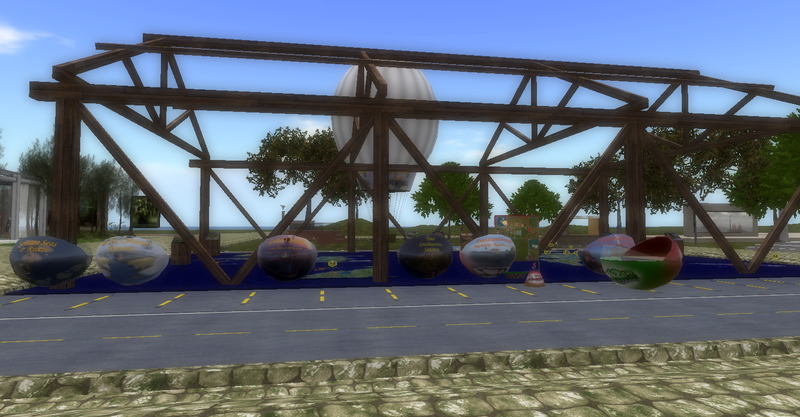 The balloon ride gives a good overview. I got impatient and hopped off shortly though. This exhibit is by an Italian artist who uses recycled materials. 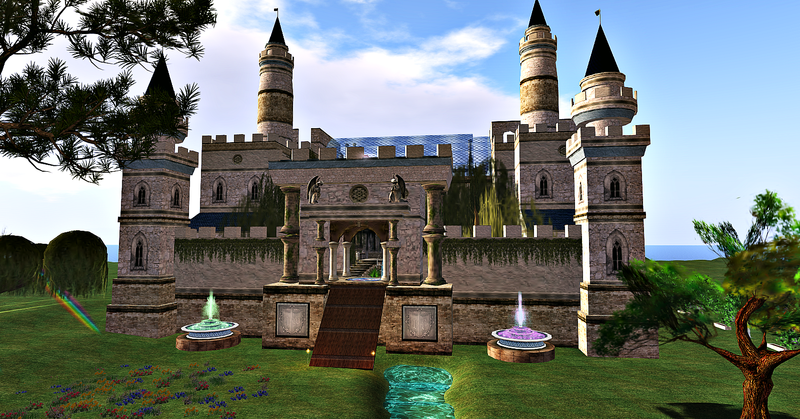 On Spellbound, the Asperger’s Community Tower of History. 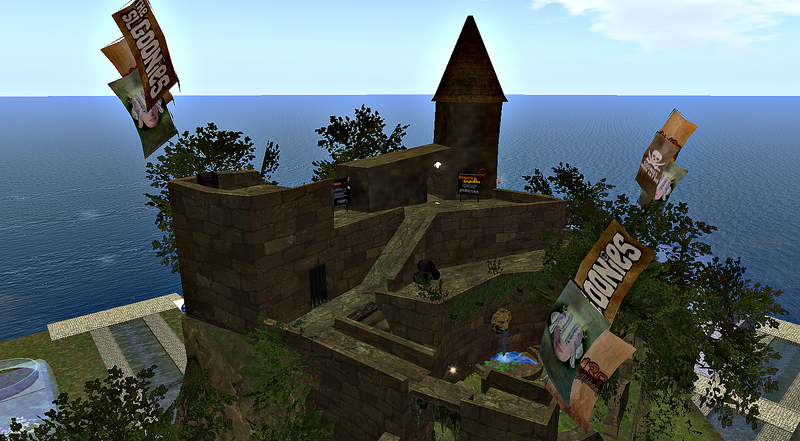 Next to the Asperger’s Tower is an adventure with free scuba gear to wear. To the side of Epi’s Adventure is Wild and Free in the Salish Sea with free dive gear. This exhibit as well as ArtBox are ones not to miss. 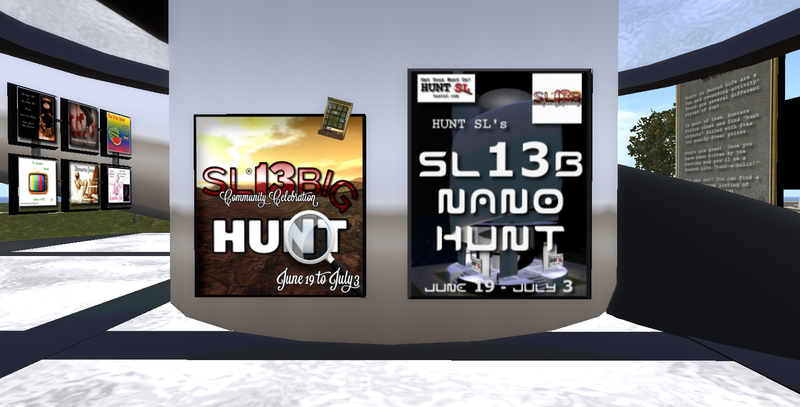 There’s a list of all exhibitors and the exhibit titles with SLurls on the SL13B Community Celebration blog. The exhibit by Chic Aeon is on Fascinate. I was pleased to see an exhibit by Livio Korobase again this year. Messing around at the Blowing in the Wind exhibit on Astound. On Spellbound is a memorable exhibit for US Military Veterans Homeless Awareness. Also on Spellbound is Reverse Bowlarity by John (Johannes1977 Resident). 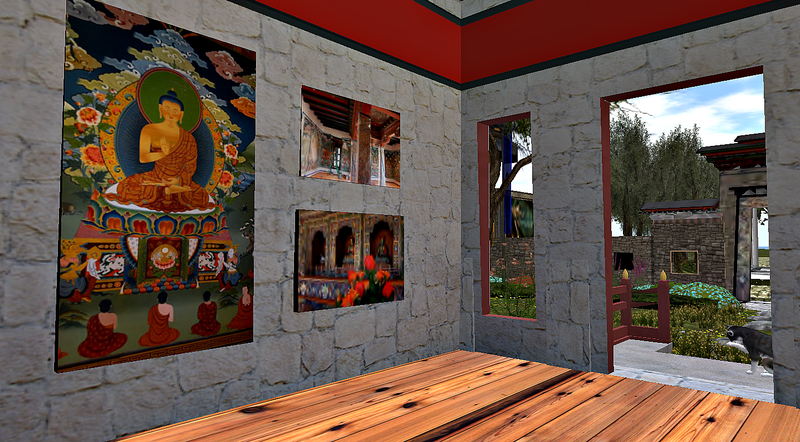 This is an exhibit of cartoon sketches of SL residents. I had a friendly moment catching up with Kitty of Kitty’s Love Shack in St John who is shown here in front of the sketch of him. 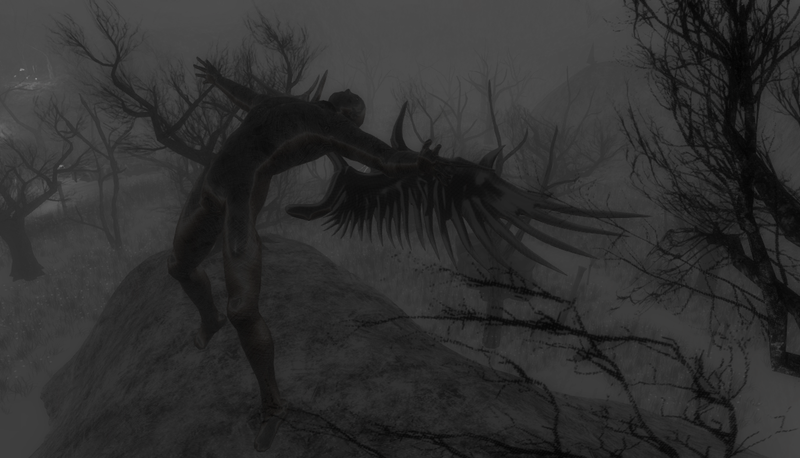 There are over 500 great photos in the SL13B Flickr group as of this writing. Most of the photos today were taken on Beguile, a few on Wonderous. I’ve really enjoyed the Great Light Gallery, which displays photographs of the Grand Canyon. My physical alt loves this part of the country. The exhibit is called Water: The Canyon Carver by Immerdar Fredriksson. At the entrance are five bells (one can be seen in the lower right corner in the picture), each with an info card in a different language. My physical alt has always been drawn to the yin energy of water creating change, carving the landscape, even though it isn’t as flashy and dynamic as Yang energy. Jadyn Firehawk is the primary builder. A reminder that some of the exhibits are quite tall and climbing or flying is required. 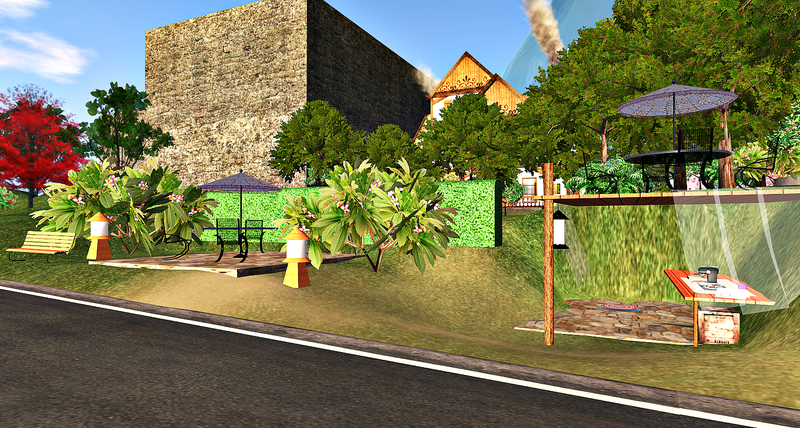 I nearly missed The Maple Nursery by Hyabusa Designs. There are great photography exhibits, including that of Ziki Questi. 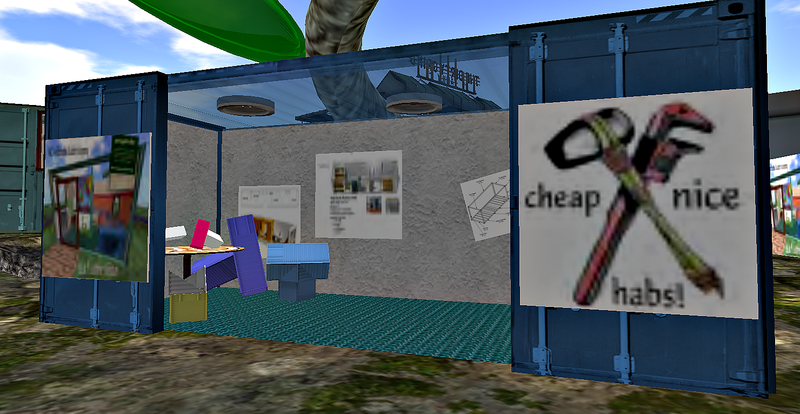 In the photo above, one of two slideshows of the photography of Sparkie Cyberstar is shown. 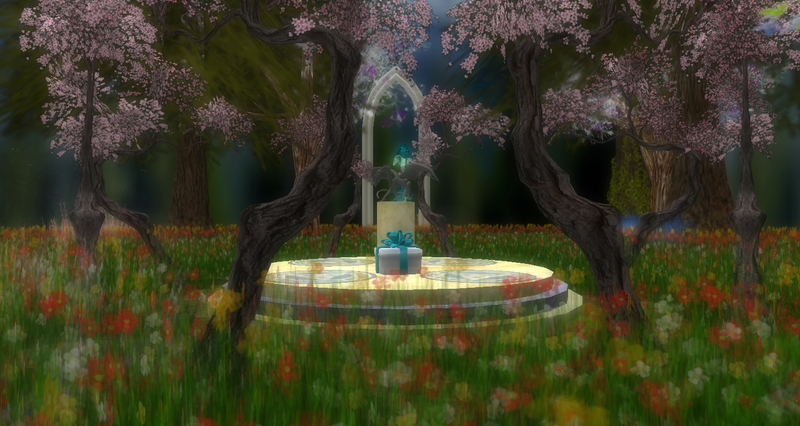 The lovely build is by Kaya Angel. I enjoyed looking at The Old Harker House, with it’s sense of history and insights learned, as shown in the photo of writing on the wall, above. By Hannah Marie Bloodwolf. I like the display for A Housing Adventure We Can Choose Now. From what I’ve seen so far, the commercial aspects are way more toned down than in years past and exhibits by merchants seem more tasteful. The 28 Wind Dreams exhibit by FaiRodis has lovely perfume pendant gifts. By FaiRodis Aviatik. Moving on to Wondrous, one of my favorite exhibits so far is Lorin Tone’s Interactive Mayan Drums. I lingered there on Press Day, playing. 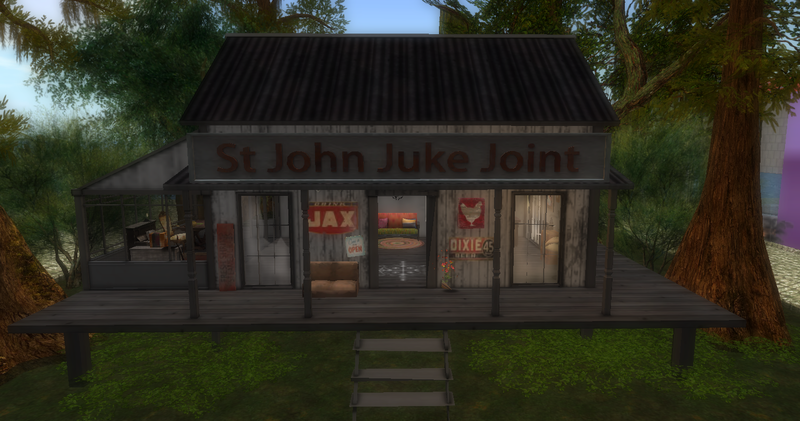 Next door to the Mayan Drums is St John Juke Joint. I took this photo on Saturday. When I went by there Sunday evening, members of the community and guests were partying. “Curiosity not killed the cat in Second Life. You can find a kind of a trick art, and the same time, you can enjoy abstract drawings. It’s recommended to choose “midnight” to view Karupa Flow’s installation. 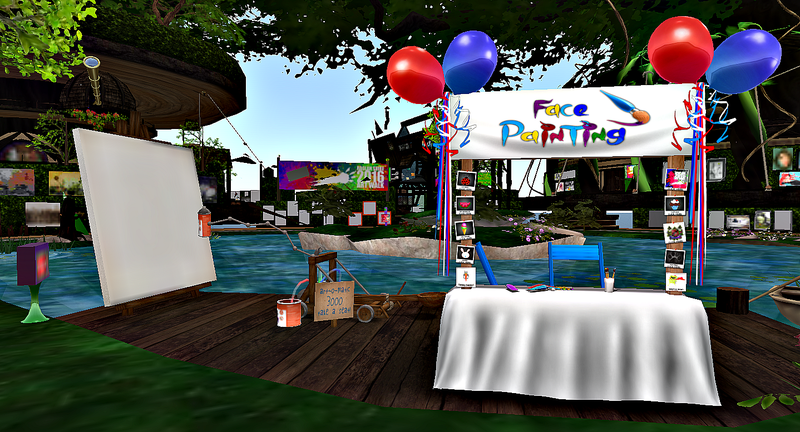 The Second Life Community’s 13th birthday celebration begins Sunday the 19th at 12:00 p.m. SLT and runs through Sunday the 26th. There are 17 regions with over 200 exhibits, and the more than 600 performers, speakers and Djs plus Resident volunteers and creators make this a celebration of the diverse accomplishments and content of us all. This year’s theme is ‘The Shared Adventure’. I’ve blogged the celebration in years past; this was the first year I got a press pass and had I known about the warm, enthusiastic welcome from the greeters and the helpful press kit I might have applied much sooner. The welcome area is on a ship; there are two ladders leading down. Between the base of the ladders is the beginning of a treasure hunt if you go on foot. Or you can use the teleporters from the bridge. The 17 regions will stay open for a week after the celebration. This week includes events with artists, speakers, educators, musicians, media, business leaders and others. 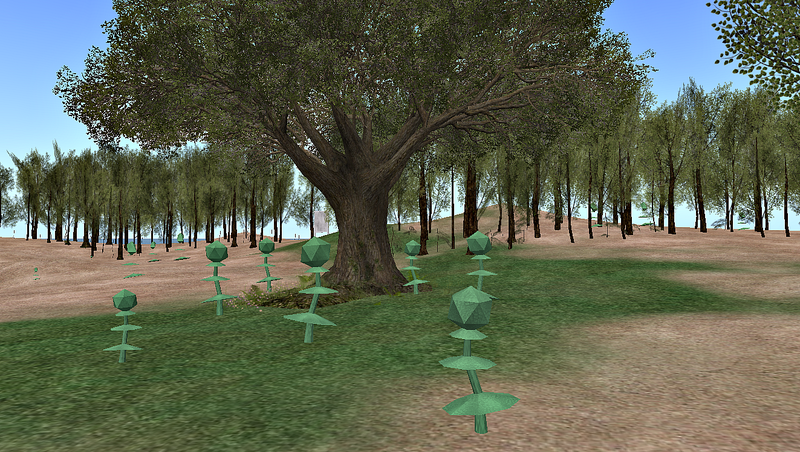 Besides the auditorium, the teleporters lead to the stages, the gift parcels and the YavaScript Pod Station. 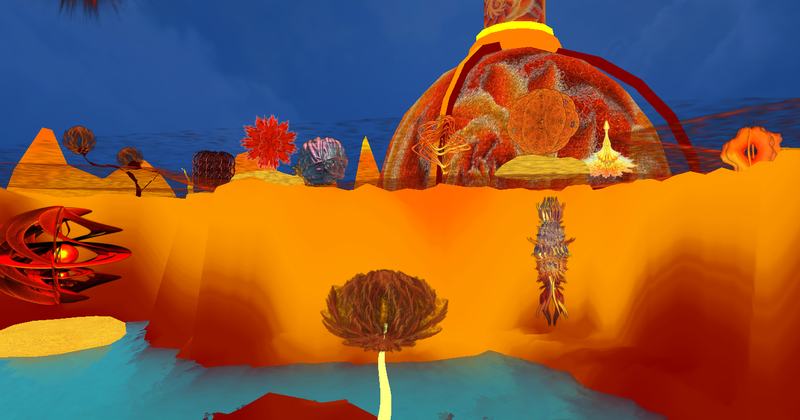 I chose the teleport to the pod station; I enjoy exploring on the mainland riding the pods. It’s located on Astound. I began walking and explored Beguile and Wondrous but will make good use of the pods this week. The gift kiosks are in many locations. For the third year in a row, we will be holding a hunt at the event. 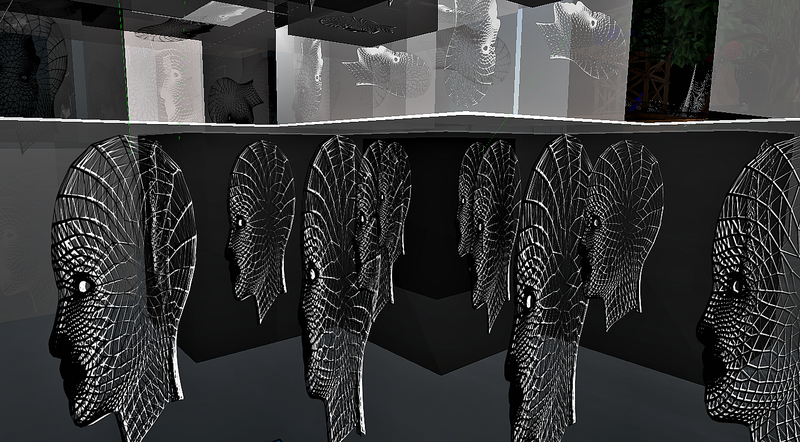 Organized by Rosamoo Mendelsohn and Xia Nishi, the hunt includes over 70 exhibitors in SL13B and spans all the regions with gifts to be found in niches and corners. One more thing: (I hopped on this ten minute meditation cushion at an exhibit in Wondrous.) 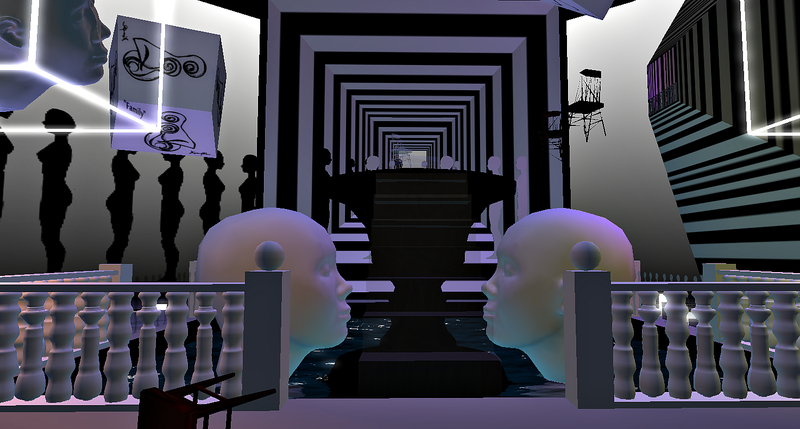 I use the LL viewer which has avatars over a certain complexity appear as colored jelly dolls. I’ve become used to seeing them everywhere. The viewer also informs me of my complexity going up and down when I add or subtract items. Most of my favorite hairs almost double my complexity number. I’m wearing shorts and a tank by DCNY I got as a freebie at Hair Fair 2013, meant to keep lag down. The hair was a gift from INK, Hair Fair 2015. It has kept my complexity way down, not that I care if people see me as a jelly doll. I really like the press badge! The art at the Bench Park has been refreshed for June. 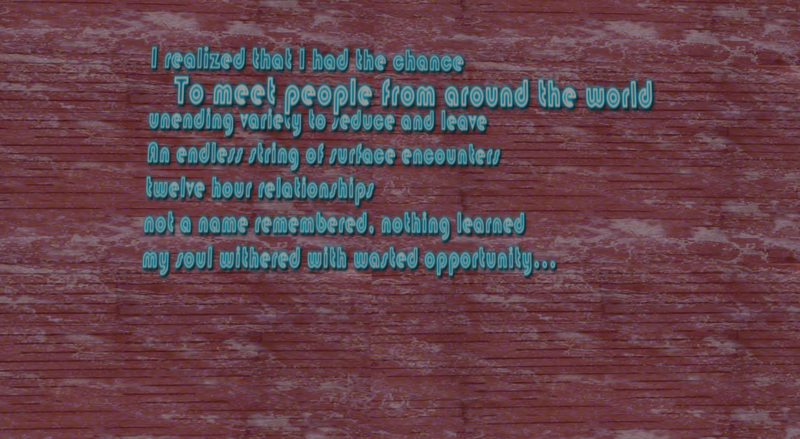 Next to the piece by Kimika Ying in the above photo is a picture called Loneliness with a NC quote by Olivia Laing that can speak for many of us in both real and virtual worlds. It’s a lovely spot to watch the sun rise and set. The piece on the left is animated; a very short video of it can be accessed on my Flickr in the left column of this page. 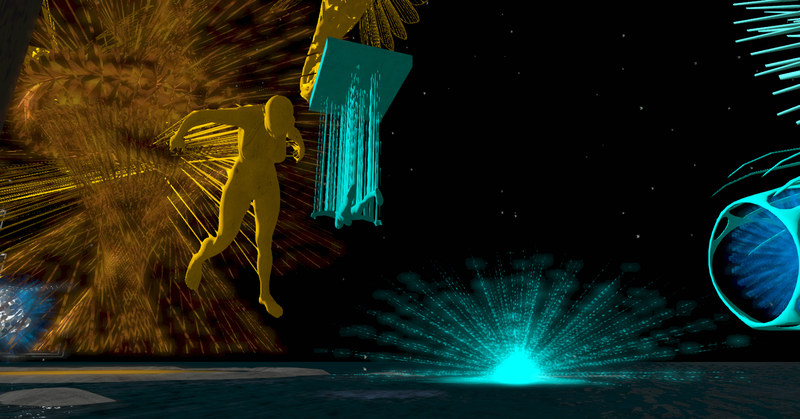 The 3D piece on the right is animated too. Behind it is our first piece for July/August by Klaus Bereznyak. It’s summer; we need to relax so July and August are being counted as one month. Anyone really inspired may change their art sooner. The renderings of destinations have been moved to the end of the wall in the park. Clicking on them will give you LMs and info. Dj Lorbo played a long and enjoyable set the first of June at Wanderlust Cafe next door. Keep an eye on the cafe for an upcoming opportunity. The wall at the cafe includes posters for current exhibits and ongoing activities. Many of the art pieces in the park also include links to galleries and Flickr pages. 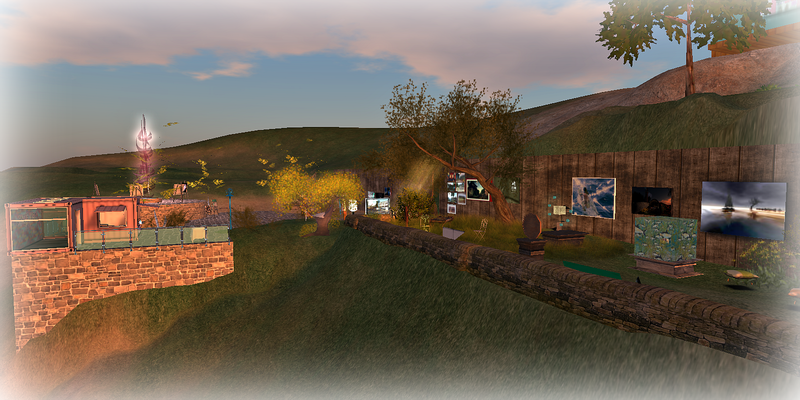 Round ten of Linden Endowment of the Arts will close the end of June. Any day now, we’ll be learning the names of the round eleven grant recipients. The current sims can be accessed from the LEA Welcome Area. These photos are reminders of the current exhibits, not all of them shown, nor necessarily my favorites and in no particular order. 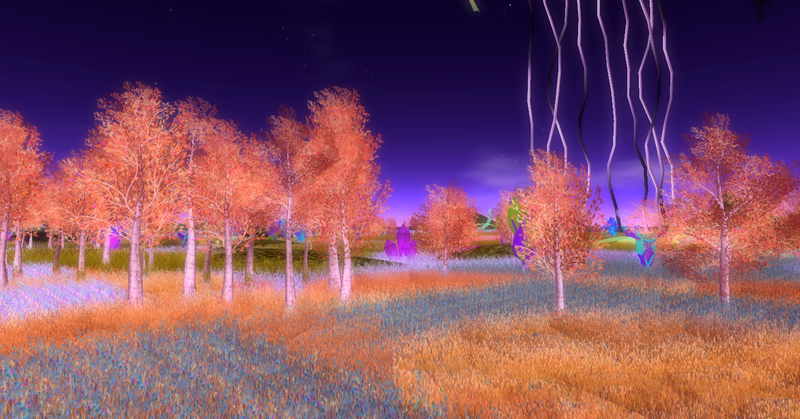 I also enjoyed one of the Core sims, LEA 1, which is a sort of scripting experiment by Kimika Ying involving reproducing plants. 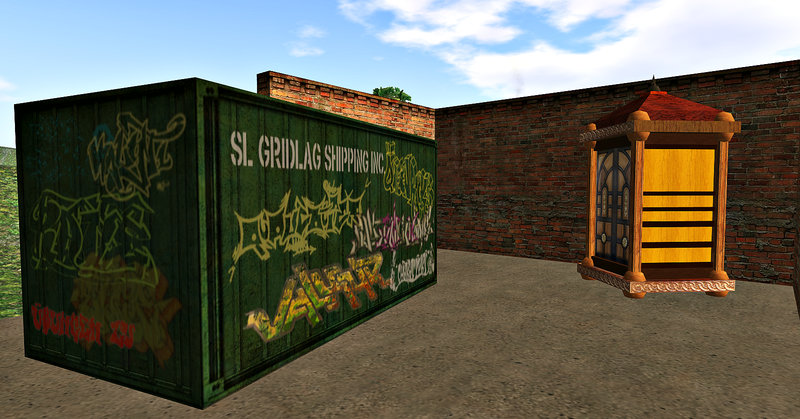 Again, these are open until the end of June and can be accessed from the LEA Welcome area (SLurl shown at the top of this post). 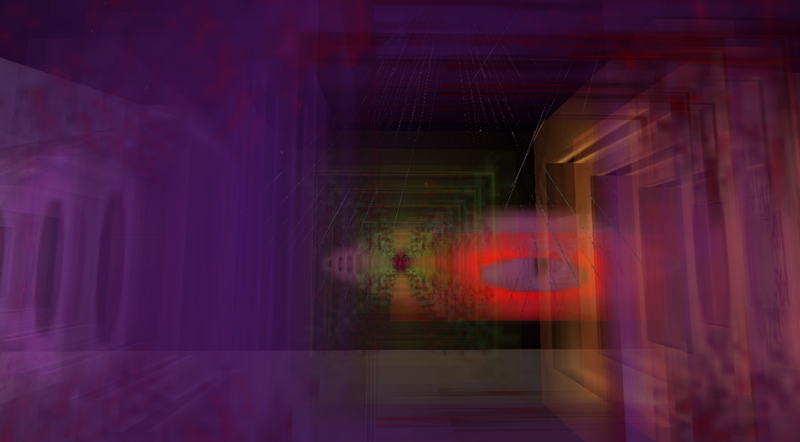 It’s easy to get around via the colorful teleports as shown on the right of the photo above. There are rides including the hedgeapillar on which a group can view the art together. Most of the art and photography can be purchased. 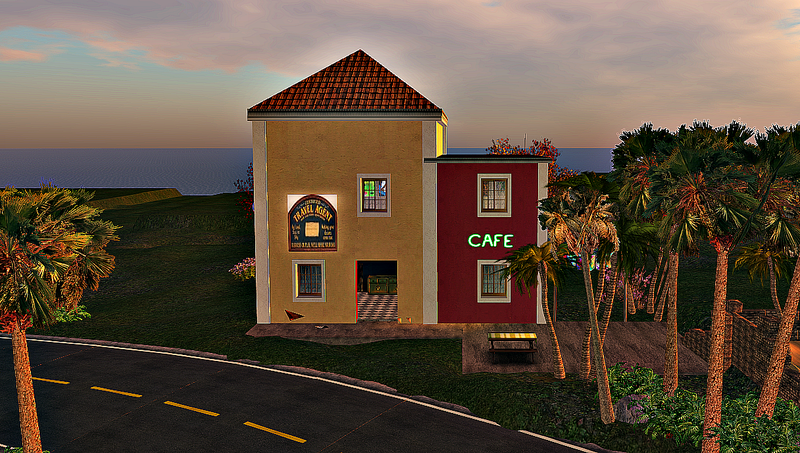 There’s a wide variety of of mediums as well as SL photography. 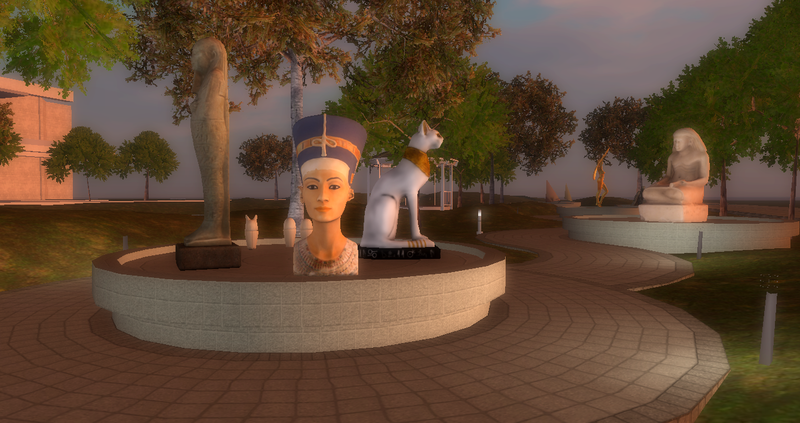 This year there are over 150 avatars participating, some of them for the first time. For some, this is the only event they do each year. Many of the participants have links to their galleries and bio cards. I’ve collected some new ones of interest to me for checking out later. 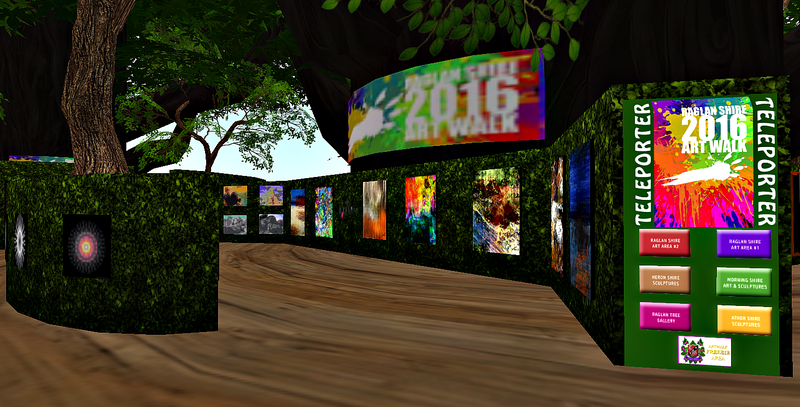 This is the first year for the artwalk in the newly- designed tree city. Not to be missed is the Art-o-matic 3000, located near one of the landing areas. You receive a painting of your profile picture on a canvas set on an easel. The Art-o-matic is set for the size of tinies but we’ve all had moments of looking undignified and you’ll soon stand back to your usual height if you’re a biggie. I always enjoy the sculpture areas. ToySoldier Thor has some pieces on display. Also by ToySoldier Thor. 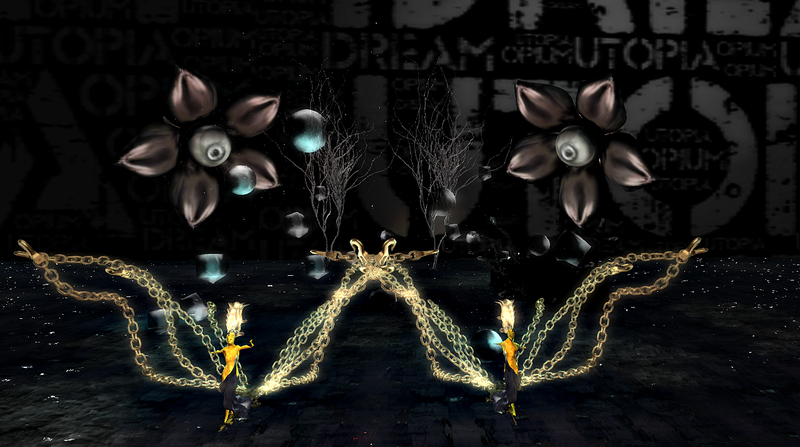 There are 3D pieces that you can walk into and watch amazing effects. (The laptop I’m on was too slow in loading the names of many of the creators.) 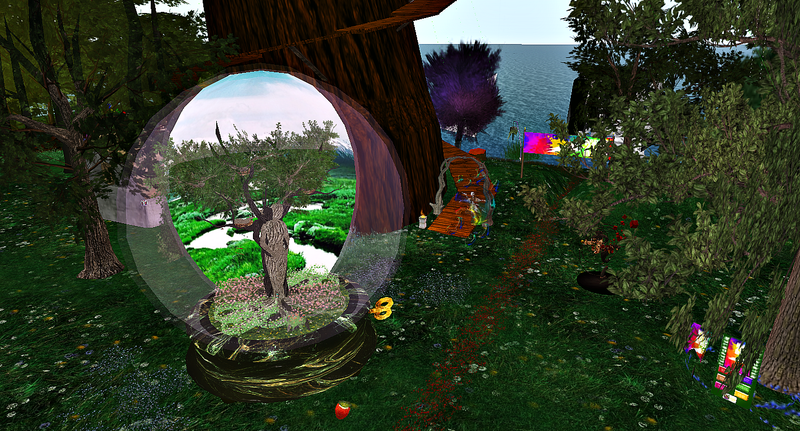 For avatars wanting to participate next year, the event is very well organized and the organizers are welcoming and helpful. Here are some photos of my visit to part of the inner ring on Gaeta V the last week in May. This will be my only post about the mainland in June, what with other areas I want to attend to. I started at the Yavascript pod station on foot, taking a right. Pods for this route leave at quarter after and before the hour. Close by is the cottage shown in the photo above; it looks great from the road. 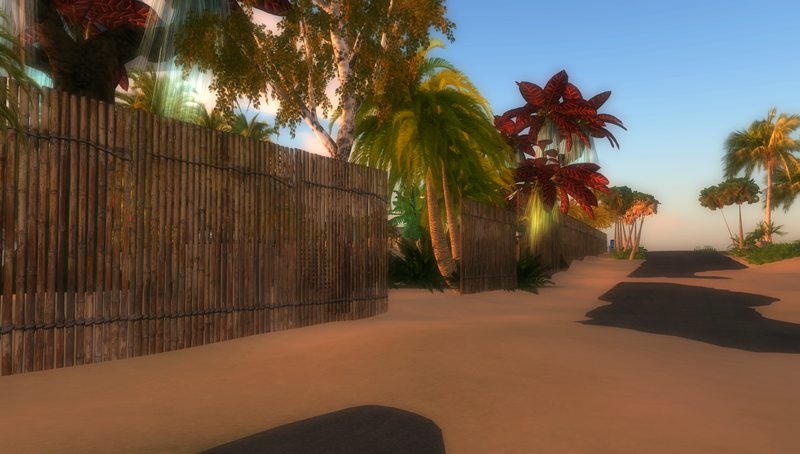 I kept my draw distance low for this trip, but even so there appears to be less foliage along this road than other inhabited areas in SL. 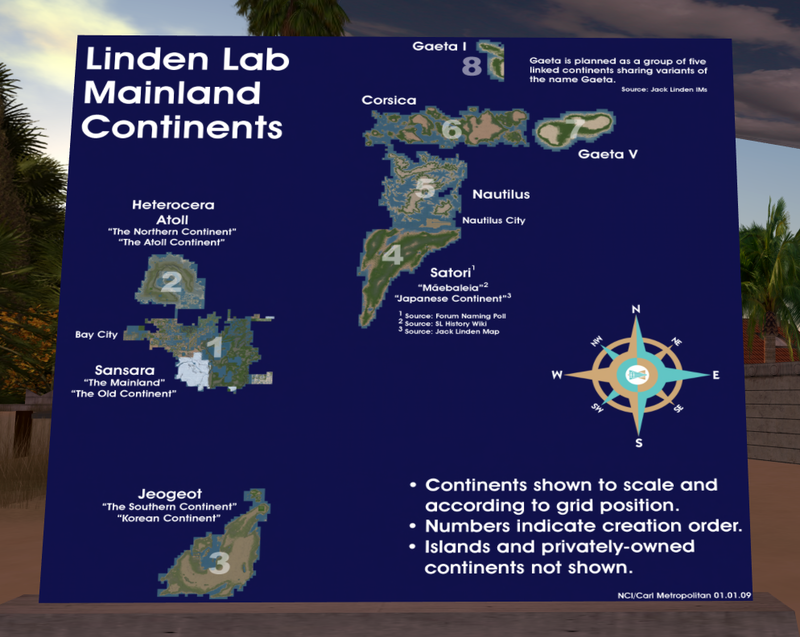 Usually I refer to any place on the continents as “mainland” but according to this map (from 2009) Sansara is called either “The Mainland” or “The Old Continent”. You can see Gaeta V in the upper right, planned as a group of five island continents sharing versions of the name Gaeta. I showed photos of Gaeta 1 last week in the post just before this. 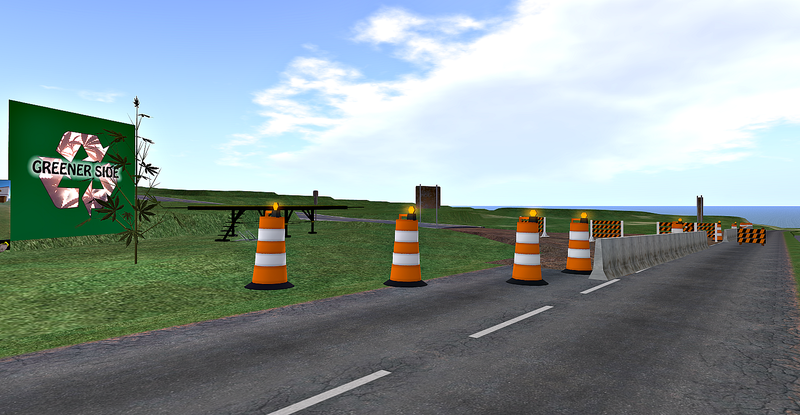 There are areas of unfinished roadwork. I looked at a work-in-progress personal Tardis. I haven’t explored inside Castle Benthem, built in 2008, yet. 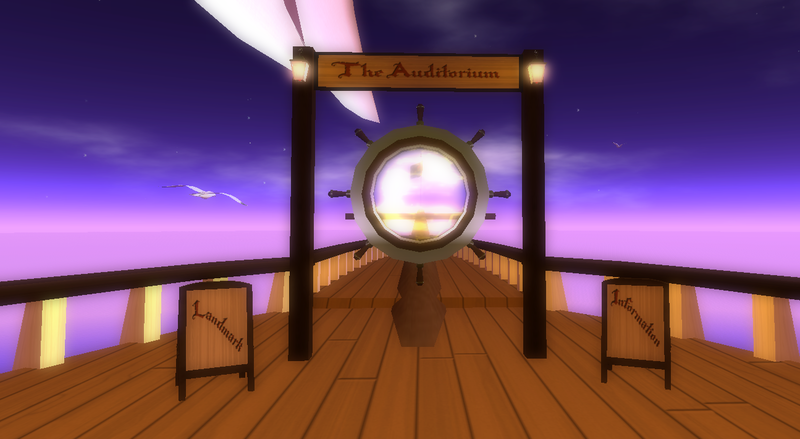 The land descriptions states that the club is open to the public and the sky ballroom is for group members only. Cafe Lachman in Nemmers is a communal area for the residents of Nemmers. 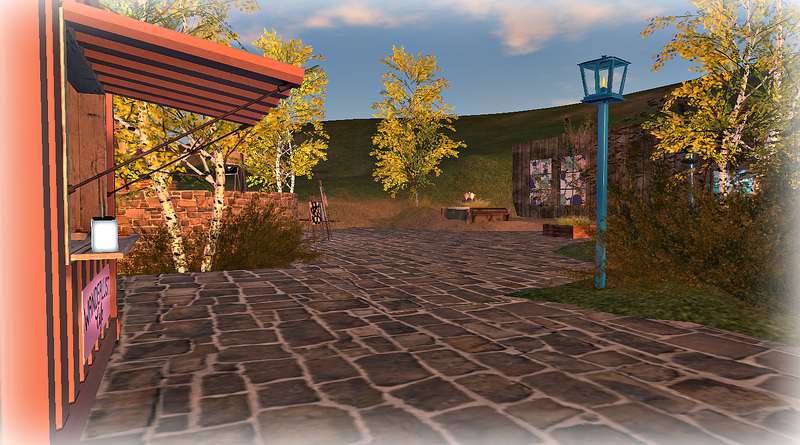 I had liked the minimalist look of this area and on closer inspection saw that it is the “Second Life Art Guild”. It’s less than four months old and the doors were locked. On the road nearby, I took another right. There are the usual shops, lots of gas stations and homes with banlines. I don’t recall every seeing this much road construction on a continent. Solved: The Mystery of the location of Bad Coffee #2. 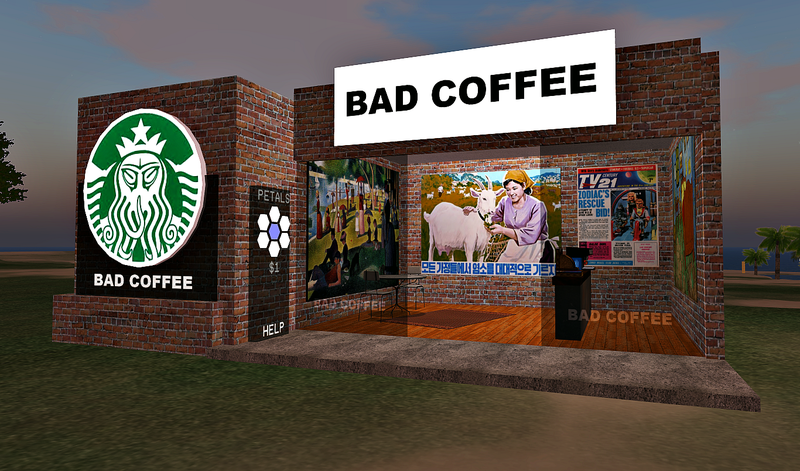 I hadn’t been able to recall where I’d seen it when I wrote my post about Bad Coffee #1 and #3 last September. 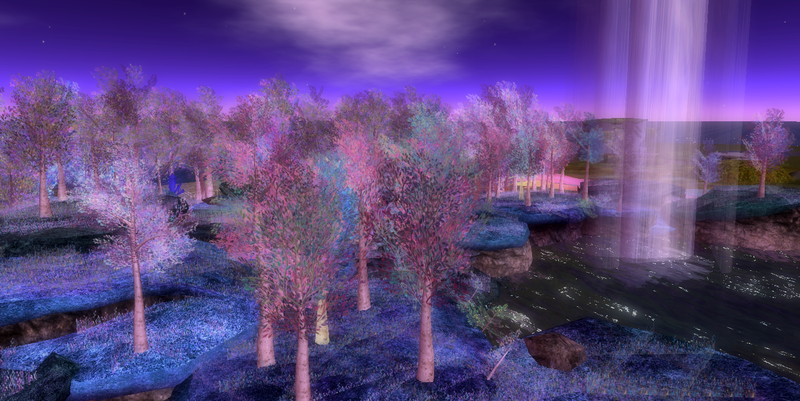 It wasn’t listed in the picks of the owner at all and according to the SLurl, I’m guessing an offer to purchase the place might be welcome. The grass is quite short on this part of the island and it’s more sandy. Further on, the sand has taken over. There’s a lot of land for sale or rent in this area. I walked and flew to another fork in the road on Route 7 in Goldbach and took a right. Soon I saw the welcome sight of one of my favorite places, the Best Coffee Shop and Travel Agency. There’s seating outdoors and in, with an art collection upstairs. Just inside the door is a clickable photo with a frequently changing landmark for travelers. There’s a wandering duck in the pretty garden in back of the building. I’ve popped into this place many times in the last few months, not realizing it was on Gaeta 5. Running out of time, I flew more quickly until I ended this trip at another fork in the road in Pucetta.